I suspect we’ve all come across LEGO at some point in our lives: either through fond memories of childhood building, or slightly more painful memories as parents stepping on stray bricks. But have we ever seen it as a complex problem solving tool? 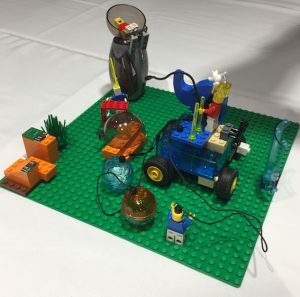 LEGO® SERIOUS PLAY® (LSP) is a professional-oriented application of the colourful bricks, that has been developed over more than twenty years and assisted companies and organisations to understand their businesses and workforce. I was interested to see how this approach might help in a University setting, and made use of funds from my National Teaching Fellowship to undertake LSP Facilitator Training recently in London. Robert Rassmussen, one of the founders of LSP, was a fascinating host with so many years’ experience in facilitating major strategy thinking at large organisations: and simply watching him work was a learning experience in itself. 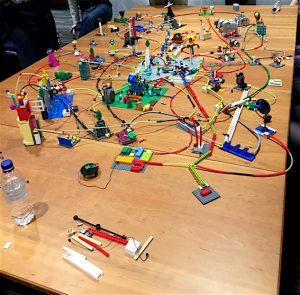 However, the group of twelve of us (business trainers, strategists and two of us from universities) were quickly finding how useful LEGO can be in surfacing deep thinking. The whole concept is based on metaphor: making models to represent real life issues, skills, needs, units etc. 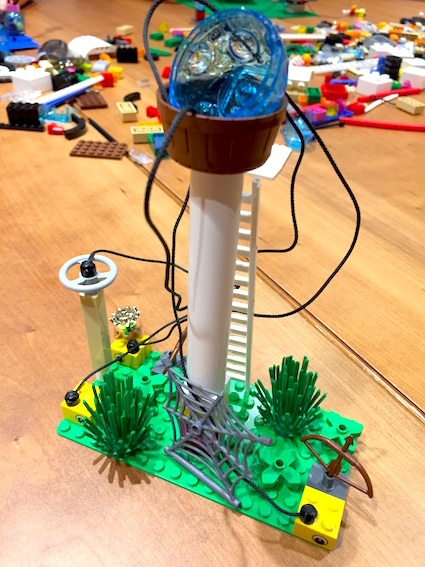 The model shown above, for example, was my representation of a university (the white pole = an ivory tower, the brown bucket the store of knowledge and research, the wires connections to other universities and the general public – represented by yellow bricks, etc.). In addition, LSP works on a 100%/100% principle: in most traditional meetings/workshops, a small minority take up the majority of talk-time, whilst the silent majority sit back and listen; in LSP, every person around the table contributes to everything, and everyone else listens to their input. We worked through scenarios such as team-building, creation of vision statements, and future strategy. Many of us have been through similar workshops in our own departments I’m sure: but in this case I felt engaged with the whole process, and the way LSP moves from individual input, to shared input, to wider landscapes and agents, to testing events against the landscape, keeps the interest and relevance going throughout. A connected landscape, showing agents acting on a future scenario. To test this with something more directly relevant to the university, I worked with a colleague from the University of Huddersfield, and a clinical practitioner to plan a workshop around the identity of an academic department. We developed a way to explore strengths in research, teaching, funding and other areas, and how to develop weaker areas through individual staff action plans. I was really impressed with the way the LSP framework could be applied to our local context. LSP takes half a day for a single/standard aim, a full or up to three days for really complex problems or systems. It requires (naturally) a good supply of LEGO, and through my NTF funds I now have the necessary supplies in-house.